Important elections ahead in LA | Fight Back! 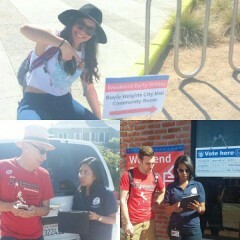 CSO members early voting at Boyle Heights City Hall. CSO members early voting at Boyle Heights City Hall. Los Angeles, CA - On Nov. 6, millions of Californians will be headed to the polls for the midterm elections. Many contested seats are up for election, including the governor, house, and senate seats. On top of that, are 12 state propositions up for voting. We encourage you to register and vote. What is important though, is where people stand to gain the most. For people in LA County, the election is tied to the struggle for democratic rights, against national oppression and the struggle for better conditions for the working class, starting with elections of LA County Sheriff. Up for re-election is Sheriff Jim McDonnell. The point is not one candidate over another but the struggle against police crimes and the rights for the undocumented in LA County. McDonnell, the incumbent, has continued the Sheriff’s Office long-standing abuse and oppression of Chicanos. From the violence at the Chicano Moratorium in 1970 to the recent abuses in the LA County jails, the Sheriff’s office has a bad record. On immigration, McDonnell has spoken in support of Donald Trump and opposed SB 54, which called for California becoming a Sanctuary State. He has worked with and supported ICE (Immigration and Customs Enforcement) coming into the county jails, running immigration status on inmates and processing them for deportation. Up until last year, the Sheriff’s office had policed the county Metro transit system, which had a long history of harassing riders at stations and on the trains. A study found that Metro police, under the Sheriff’s office, issued tickets disproportionately to African-American riders over others. Most importantly, though, is the Sheriffs’ continued crimes against Chicanos and African Americans. The past few years have seen a rise in the number of police killings and harassment. For instance, LA Sheriffs just recently murdered two more young Chicanos, Anthony Vargas on August 13 in East LA and Carmelo Pizzaro July 19 in Pico Rivera. The struggle against police killings of Chicanos is part of the struggle against Chicano national oppression. And voting out the white Sheriff McDonnell that reinforces that national oppression is important. Also, of importance is the race for State Superintendent of Public Instruction. Currently running is Tony Thurmond, a former local school board and city council member. This race is important because of the attacks on public education. Thurmond, who has a history of fighting against Trump and Betsy Devos’ privatization efforts, has vowed to continue. California currently ranks number 46 in the amount of money the state spends on each student. In California, public education is facing attacks from billionaires like Eli Broad and Bill Gates in funding private charter schools, which drain public funds and students from schools. Thurmond, who has the backing of public labor unions, wants to make for-profit charters illegal, put more pressure and accountability on existing charters, institute bilingual education, and fight for more funding. In LA County, where 73% of students are Latino, billionaire Eli Broad and charter school corporations like Kipp Charter have been spending big money to privatize schools. This attack has mainly been against working-class Chicano and African-American neighborhoods. With the influx of charter schools in these neighborhoods, students leave. As students leave, existing public schools lose funding and layoff teachers. Currently the United Teachers of LA have reached an impasse with the Los Angeles Unified School District board and have voted to authorize a strike. Privatization is one of the big fights. Charters and private schools have also gone hand-in-hand with gentrification. Neighborhoods with more charters are facing the sharpest attacks of gentrification. The struggle for equality and public education has been a long-time demand for Chicanos. There are currently 12 propositions this election. While all will have an impact to some degree, many of them deal with housing and living conditions. Housing and rental costs are higher than they were before the Great Recession. In LA County, over 60% of people rent. On top of that, Los Angeles has highest percentage of renters for any major metropolitan in the United States. This means working class people in LA face evictions, foreclosures and homelessness at higher rates than others in the U.S.
For years, people have fought for universal rent control. As property values increase, developers and flippers are looking to make money off of working-class renters, buy up properties and raise the rent in cities across the state and in LA neighborhoods like Boyle Heights. Wages have not kept up with inflation. People are having to pay more than they used to for housing. And for those who can’t keep up, will be kicked to the street if they can’t pay. Proposition 10 will allow for cities and counties to have their own rent control. This has the support from labor unions and renters’ rights groups across the state. Proposition 10 should be supported. Living conditions are especially harsh in working-class Chicano and African-American neighborhoods where very few people own their own homes. Gentrification and displacement are sharpest here and are linked to the privatization of public schools and increased harassment, violence and killings from the police. This proposition, if put in place, will help people to fight for a universal rent control for all LA County and help people from becoming homeless. The struggle against national oppression won’t end on Nov. 6, no matter who wins the elections. We must continue to fight against the Sheriffs and LAPD. We must win justice for the victims of police killings. We must also continue to struggle against the billionaires trying to privatize schools. Kipp Promesa Charter is currently trying to build another mega school in the Chicano working-class neighborhood of Boyle Heights. Strong protests from teachers, parents and community have stopped co-locations but now Kipp wants to build a mega charter school in the middle of Boyle Heights. The teachers’ potential strike is directly linked to the struggle against privatization and for right to good public education. Affordable housing is a vital demand for working-class people. People are being driven from their homes, and after November we must continue to fight against evictions, for universal rent control and for affordable housing. Most important, though, is that we join grassroots organizations dedicated to fighting against national oppression. Organizations like Centro CSO have a long history of struggling against police crimes, and supporting public education, in other important struggles. Join us every third Wednesday of the month at our meetings in Boyle Heights and call us at 323-943-2030 for more information. Jared Hamil is a member of Centro CSO.